What’s an unwelcome surprise? Depleted fire extinguishers when you need them most. Imagine for a moment that a fire breaks out in your home or business. You hurry to find the fire extinguisher, but when you activate it, instead of a steady stream of fire fighting chemical foam, all you see is a hesitant cloud or a small, weak puff. Here’s an unwelcome surprise: your fire extinguisher has gone dead and is now depleted. What should you do next? As long as you take care of it, and exercise timely maintenance, your current fire extinguishers should last at least ten years, and at most twelve years. Once it reaches this advanced age, you need to schedule something called hydrostatic testing. The purpose of hydrostatic testing is to see how intact the external casing is even after all those years. If your fire extinguisher passes the hydrostatic test, then you can continue to use it until it finally gives out. Pressure leaks even if the extinguisher hasn’t been used recently. 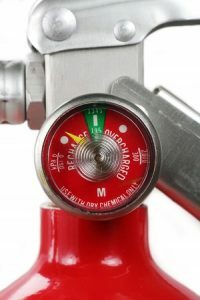 Signs of cracking or clotting in the nozzle. The handle is loose or snaps off. The pin on it isn’t there, or it doesn’t work. The external casing is dented or otherwise damaged. There is no inspection tag certifying that it is safe. It didn’t pass the hydrostatic testing phase. What you should do with a depleted fire extinguisher will depend on several factors. For one, consider how old the fire extinguisher is. Although worn out fire extinguishers need to be thrown away, comparatively new ones still have a chance. The parts of these extinguishers could be repaired, sparing the entire unit. However, there are protocols for disposing of depleted fire extinguishers. If it still holds a charge, full or not, get in touch with your closest fire department. See if they accept donations. In case they don’t, you will need to visit a facility that specializes in the disposal of chemicals and other similar substances – potentially dangerous ones. Make sure the fire extinguisher is completely dry. Pull the lever to verify all the pressure inside it has been expended. Then detach the head and perform a visual inspection for any remaining charge. Any recycling plants which will accept the casing can presumably take it off your hands. This entry was posted on Friday, November 3rd, 2017 at 3:59 pm. Both comments and pings are currently closed.